The L420 related to the k420 shirt. This one is for ladies, like the K420, it is heavyweight popular affordable and very good quality. Coming at 7 ounces, preshrunk with a relaxed fit, you just can't go wrong with a shirt . 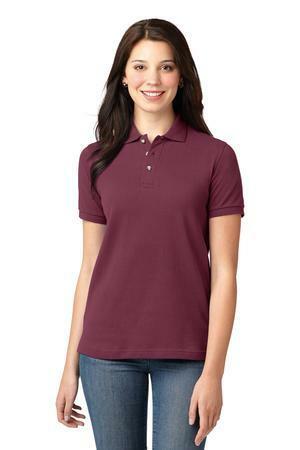 The ladies polo shirt comes in a variety of colors over 10 colors. So if you have a restaurant or need Polo shirt for every day wear, this is a shirt for you. At $24.99 including left chest Embroidery included, free shipped, plus we give two shirts free when you order 48 quantity or more. So don't wait order today to get two shirts free half-price on the embroidery. There is no set ups and seven day turnaround on a beautiful heavy weight polo shirt.